I seem to be coming up again. It always feels like walking into sunlight from a dense fog - all of a sudden I can see, and doing things seems possible. Although I don't really feel like I'm in a fog when I'm *in* it. I'm getting better and better with my diet. I did a whole-raw day last week and felt really wonderful, comparatively. Then I rewarded myself with chocolate. As always, it isn't the chocolate *that* day - it's the twice-as-much-chocolate the next day. But I caught myself again, had a good day, then had a no-sugar-no-flour day yesterday, and today I'm doing raw again. Heh. The sun just came out. Hello! Right now I'm eating my cashew/vegetable salad. It doesn't really have that much cashew in it, I just call it that to distinguish it from other salads. I haven't made it in, probably, a year. Chopped up cauliflower, carrot, celery, and whatever else. In this case raw peas and baby corn. Then the chopped cashews, and all slathered with Miracle Whip. NOT 'salad dressing'! Not even the namby-pamby stuff that comes home from the market. MY Miracle Whip sits out on the counter and gets nice and sour. Can you say Tangy Zip? I'm working on the house again. Finally. 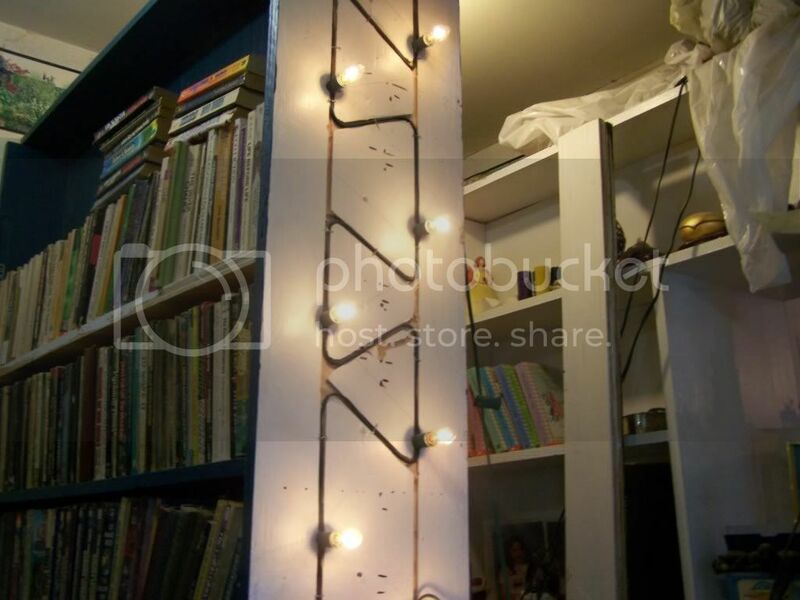 I've figured out a way to light the decorative endcap shelves that I got stuck on last November. You can't tell here that I'm up on the top of a 2 1/2 foot ladder. (Yes, my hip *does* feel better. Why do you ask?) 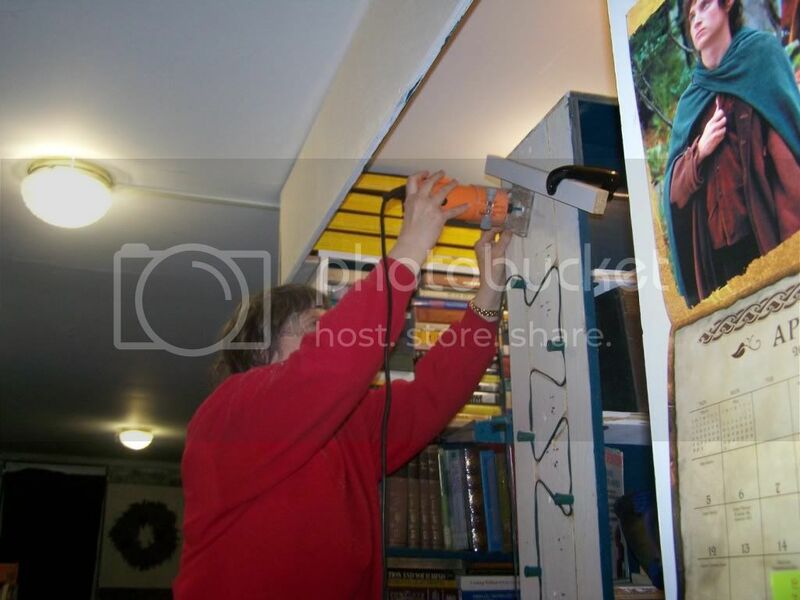 First I used a router to make a trench in the back wall of the shelves; I had to wind it around in order to make the lights come out in the right places, since I didn't want to cut/splice the cord. Then drilled a hole *just* big enough for the light socket to stick into it, and judiciously applied staples to make it stay. Yep, they light up. Maybe tomorrow I'll actually put up the shelf unit.